After implementing Swiftype, search is finally taken care of. Today, I’m happy to be selling bulbs instead of worrying about software. 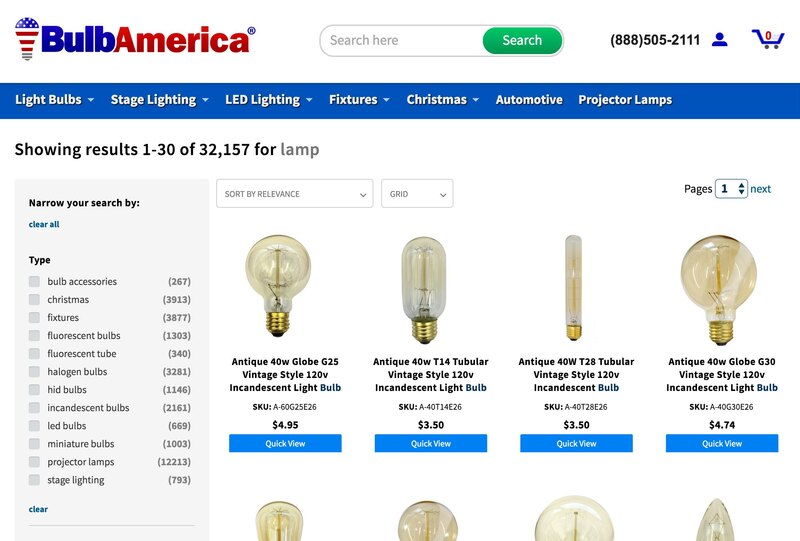 With over 50,000 unique light bulbs, and over 250,000 customers, BulbAmerica is the largest ecommerce store for light bulbs and fixtures in the United States. BulbAmerica has an extensive inventory which makes on-Site Search a critical tool in helping users find the products they are looking for. Ease of implementation, speed of search result delivery, and custom result ranking capabilities for individual queries. CEO Corey Frons has been a diligent store owner since starting the company in 2003, switching ecommerce platforms on multiple occasions and working each time to find a Site Search solution that paired well with his website. In each of these iterations, implementing search required weeks of development work, and in some cases, ongoing data entry to make search results match expectations. As soon as Corey switched to Swiftype, he found results highly relevant, and was able to get Swiftype up and running at the same level as his previous ecommerce search providers with very little work. Additionally, Swiftype was much faster than a competing Shopify app which Corey tried before being recommended Swiftype. The difference in value between users who begin shopping with search and those who don’t is dramatic. As Corey reported, users are 4.6 times more likely to convert after beginning the BulbAmerica site experience with Swiftype and these same users spend 12.3% more per order on his site. After seeing the impact that Swiftype has on conversion and purchase values, Corey recognized the need to feature Swiftype search more prominently. He experimented with a range of placeholder text, increased the size of the search bar, and moved search to a header that stays fixed in place regardless of where users are on the page. To help optimize search results for the most popular queries, Corey’s team uses Swiftype’s custom result ranking feature in BulbAmerica’s account dashboard. This tool allows them to completely customize results for top product searches, moving high margin products to the top of the results page and deleting results that don’t convert as well in seconds. Furthermore, Corey’s team creates custom result sets for queries that return no results, proactively guarding against blind spots where users might hit dead ends. Lastly, because Swiftype is integrated with BulbAmerica’s Shopify product catalog, search results are always up to date. This frees Corey and his team’s time to focus on customer-facing improvements, such as user interface tweaks or inventory expansion. Real-time indexing, coupled with Swiftype’s user friendly dashboard, allows Corey and all non-technical stakeholders at BulbAmerica to manage search without the need to worry about a back-end infrastructure. After migrating his store to a new ecommerce platform, Anton realized the native search was ineffective and came to Swiftype for help.